From the website Patently Apple this week comes another curious patent that apple company posted just over a year in the Registry Office of Patents and Trademarks of the United States and this week has been confirmed. Product designers give Apple raised more use to those clips that are incorporated into most MP3 players so that we can engage in our belts or pants. So from Apple have devised a clip, which can be introduced into the device and to extract features in addition to its traditional role, a touch panel. This panel would serve remote: give us the ability to manage our devices without removing them from their pockets. It is unclear if this would move touchpad as a mouse or incorporate buttons. As described in the document filed with the U.S. Patent Office, this idea is associated not only with the iPod Touch, but could also apply to the iPhone, the iPad, a camera, a joystick, or even the MacBook a "convertible laptop" (it's the first time that Apple uses the term in one of its patents). Probably never get to see this idea applied to Apple devices, as usually happens with most of the patents registered by the company. 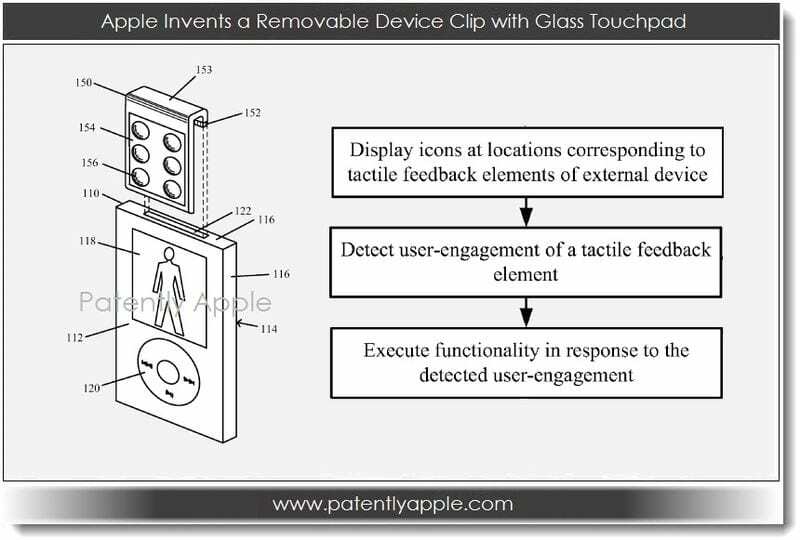 Article Apple patents a touch panel clip was originally posted in News iPhone .